US, 1990, 96 minutes, Colour. Rick Schroder, Brad Pitt, Carrie Snodgress. Across the Tracks is a conventional drama about sibling rivalry. Rick Schroder (grown up after his appearances in The Champ and a number of telemovies in the 80s) portrays a tearaway, imprisoned for stealing cars, let out on parole. Pitt (who was about to appear the following year in Thelma and Louise and in three years in River Runs Through It and Kalifornia) is his brother. Brad Pitt is the champion runner at school, driven relentlessly for success by the memory of his demanding father. Schroder goes back to school, immediately gets entangled with fights, meets his old friend who is a drug dealer, is actually picked for the track team at his school and begins to excel. He goes running with Pitt. What emerges is a challenge. 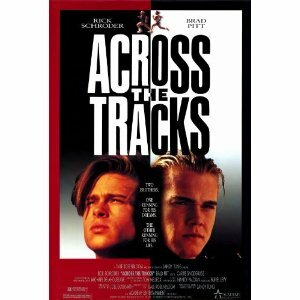 Pitt becomes jealous, finds that his brother is a faster runner than he is, is tempted to give up. When his brother lets him win the final race so that he can get a scholarship to Stanford, he is angry. However, an encounter with the drug dealer and his brother saving him brings him to his senses and he goes to a new life. Carrie Snodgress, star of the 70s, portrays their mother. The material is familiar enough but is interestingly portrayed by the two stars - and the track events will be of interest to sports fans. 1. A popular theme? Families, brothers, sibling rivalry? 2. The city, homes, stores? Schools? The track and the staging of the running events? Musical score and songs? 3. The title, the place where the brothers come from, the play on words with the track events? 4. Billy, stealing cars, friendship with Louie? His lifestyle, going to jail, being released on probation? His mother's joy at having him home? Joe and his reserve? Their sharing a room, talking, the memory of their father? Billy and his going to the school, the principal giving him a chance, his being taunted into fighting by the group? The phone call to his mother, another chance? Meeting with Louie, the drug dealing, taking drugs, trying out the clothes in the department store? At home, going for runs with Joe, his abilities? His being picked for the team? The training, watching Joe, their discussions about their lives? The build-up to the competition, Billy's success, Joe and his opting out, Billy confronting him? The final race, Billy pulling back and letting Joe win? His response to Joe's anger, giving him the chance, praising him as a runner? Saving him from Louie and the bashing? Farewelling Joe going off to college? His future? 5. Joe, the good boy at home, racing, discussions with the coach, the possibility of scholarship, studying? His reaction to Billy's coming back, sharing the room, discussions? His continuing to run, work hard, get exhausted, the training with Billy? His overwork, tiredness? Running with Billy, the newspaper article about their success and his refusing to read it? His shyness with girls, the attempted phone call, the discussion inviting his girlfriend to the track event? His anger with Billy, his telling off his boss and getting the sack, drinking, the encounter with Louie, his racist remarks, throwing the drugs into the water? His not turning up, Billy finding him and confronting him? The final run, doing his best, just being beaten in fact by Billy? His upset, wanting to earn his scholarship? Louie, the bashing, Billy saving him? Going to college? 6. Rosemary, the death of her husband, trying to bring up the boys, blaming herself for Billy's going to prison, her fears for him? Her love for Joe? At home, at work, trying to cope? The moods of the boys, trying to encourage them, her pride in them? 7. Louie, his friends, drug dealing, bad company, trying to get Billy as a dealer and Billy's refusal? Going to his house and his telling Louie off? The encounter with Joe, the drugs, the racist remarks? Joe and his punching him, throwing the drugs away, the final confrontation? 8. The school, the principal giving Billy the chance, the boys and their challenge to him, their change of heart, the coaches and their support? 9. A slice of life in ordinary America, ordinary American families? The possibility of success, developing talents, a future?